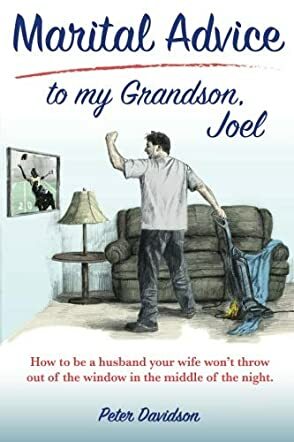 Marital Advice To My Grandson, Joel by Peter Davidson is, as its title clearly explains, a list of advice from one man to another. The author’s wife, Beverly, was actually the inspiration for this book, which was given to the author's grandson when he got married. The book is amusingly dedicated to Joel and his wife, Abby. The topics tackled by the author are very interesting and some of the time are completely unexpected. They are always fun. Marital Advice To My Grandson, Joel by Peter Davidson allows Joel and the reader to have fun primarily while giving marital advice which sometimes is quite relevant. However, most of the time the advice, while being far from ludicrous, can be hilarious and selected to make us laugh. The real life examples are extremely entertaining and, like a picture, are worth more than a thousand words. The advice about the date of the wedding must ring true to men, but it sounds extraordinarily ridiculous to women. For instance: “The wedding can be any time the bride wants, but not on a Saturday or Sunday during football season.” The choice of issues is, in itself, comical. I also enjoyed the “epistle” metaphor and pun, as well as the comments in parenthesis. I particularly liked the part about “female shopping logic,” even if I do not agree at all (being one of those women who cannot stand the very idea of shopping). I highly recommend this fun “timeless wisdom,” and I thank the author for a very nice read!